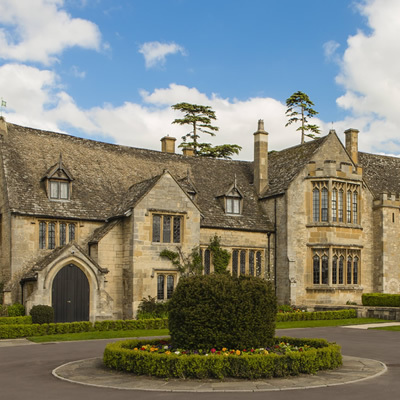 Located on the outskirts of Cheltenham, Ellenborough Park lies next to Cheltenham Racecourse. Famous for hosting the Gold Cup every March, the Racecourse provides the perfect backdrop from the hotel whether it’s race day or not. Even though you are just a few miles from central Cheltenham, being surrounded by perfectly manicured grounds and a property that dates back to the 1500’s you can feel an air of country calmness that can’t be manufactured. 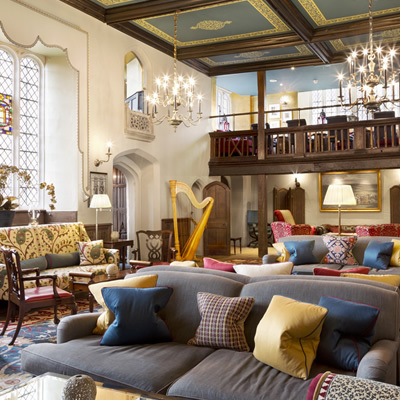 As you arrive at Ellenborough Park and travel up its meandering driveway you can’t help but be enchanted by this historic hotel and its grand facade comprising of Cotswold stone, gothic touches, and church-like commanding window panes. We had arrived somewhere rather special, and after being welcomed through the entrance we were not disappointed as the grandeur continues inside. 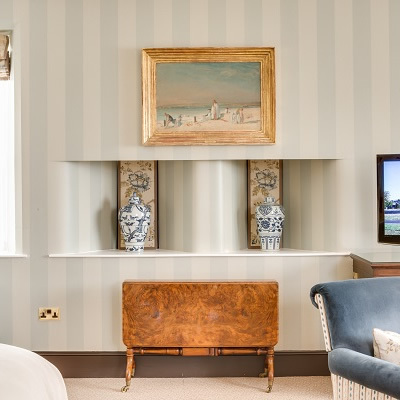 We passed many cosy alcoves adorned with rich fabrics on the way upstairs to our suite. 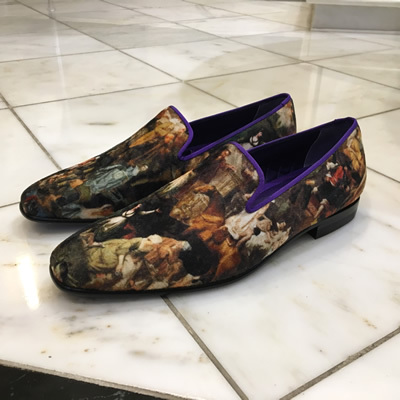 The staircase has been hand painted with a forest mural, like something you would find in a fairytale, and just like a fairytale we couldn’t wait to see what surprises we would find next. 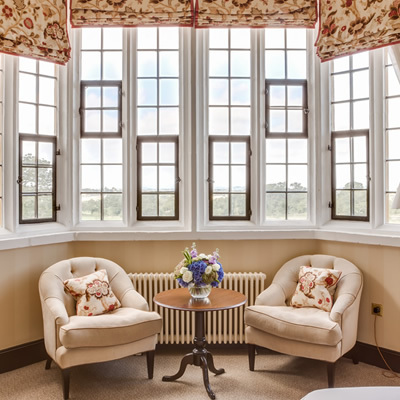 We were delighted to discover that one of the bay windows we were admiring from the outside leads us to our suite. This allowed us unrivalled views across the stunning grounds surrounding Ellenborough Park. The suite also featured a bureau which sits in front of another window. The large bed is also in the same open-plan area, but with so much space to play with no area imposes on the other. 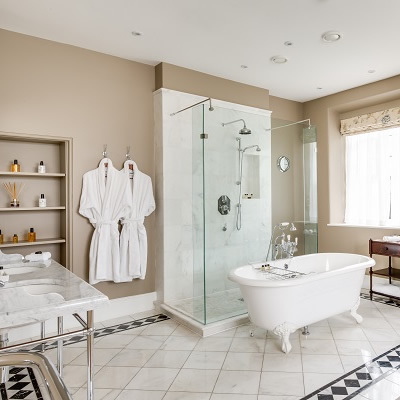 The bathroom was simply stunning, with twin basins, a roll top bath in the centre of the room, and a large wet room, this bathroom was certainly designed to impress, and indeed it does. Other facilities include an outdoor heated swimming pool, spa, steam room, and a fine dining restaurant. All the facilities are excellent and it's easy to relax and rejuvenate, and the staff were exceptionally helpful and accommodating during our stay. We had a magical experience and would love to return again. 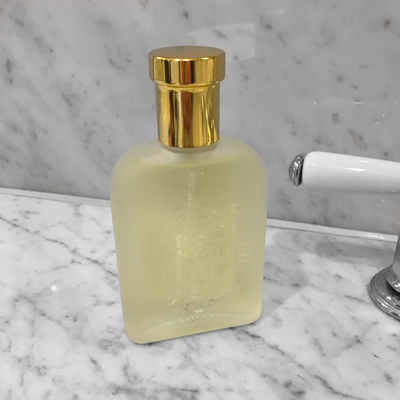 It's essential to ensure you always have the perfect travel companions, this is what we packed in our suitcase for our visit to Ellenborough Park Hotel.